The RBNZ released its much-awaited economic update earlier today. And if y’all can still recall, the surprise announcement that the RBNZ will release this unscheduled economic update sent the Kiwi tumbling against its peers last week, and the Kiwi took another hit across the board yet again when the update was released today, so what did it have to say? The RBNZ noted that low dairy prices are a problem, though. And if you’re wondering why that’s a big deal, just know that New Zealand’s economy is literally powered by dairy exports. Concentrated milk alone, for instance, accounts for about 18% of New Zealand’s total exports, which is a pretty large chunk. Also, as I highlighted in my Review of the RBNZ’s Annual Statement of Intent, the RBNZ is worried that there will be a rise in non-performing loans, since persistently low dairy price would lead to “significant financial pressures for dairy farms, with a significant proportion of the sector facing a third consecutive season of operating losses.” In short, low global dairy prices would hit both the dairy and banking industries. And for reference, highlighted below are the RBNZ’s forecasts, as presented in the June Monetary Policy Statement. And as noted by the RBNZ and as revealed by the CPI report from Statistics New Zealand, Q2 CPI increased by 0.4% on both a quarterly and annual basis, so a swing and miss on both instances. 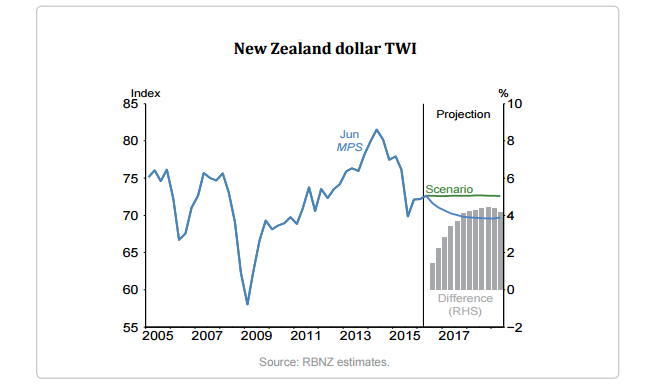 As I noted earlier, the RBNZ was blaming its inflation woes partially on the Kiwi’s recent strength, and rightly so, because the Kiwi’s trade-weighted index (TWI) has been appreciating contrary to the RBNZ’s projected scenarios. Oh, if you have no idea what the TWI is, it’s basically what it says on the tin – an index of the Kiwi’s performance against a basket of 17 currencies that are weighted based on their level of trade with New Zealand. Getting back on topic, the RBNZ presented two scenarios in the June Monetary Policy Statement. The first and ideal scenario is that the Kiwi will steadily slide lower until it reaches a TWI of 70 by 2017 and then mill about in that level until about 2019 or so. The other scenario assumes that demand for the higher-yielding Kiwi will persist, so the TWI is projected to remain steady at around 72.6. RBNZ more likely to cut? The more determined tone is noteworthy, but the RBNZ still has to contend with the threat of worsening the potential housing bubble, which is what I’ll be discussing next. What this means is that the threat of a housing bubble is getting worse, but a rate cut would only make it even worse, so the RBNZ is finding other means to address this housing bubble first, which would then give the RBNZ enough room for a rate cut. You can read about these macro-prudential measures here, if you really want to. The one thing worth noting here is that consultations are expected to finish by August 10, which is also when the next RBNZ monetary policy decision would be. This means that if these proposed measures push through by then (or before), the RBNZ may have enough room for the rate cut that it wants. Given the RBNZ’s worries and rhetoric, as well as its attempt to contain the housing bubble through alternative means, which may then give the RBNZ some leeway to cut rates, do you think the RBNZ will be cutting rates in August? Share your thoughts by answering the poll below!